On my recent fantastic holiday to Timor we were hosted by a village near Kefamenanu [http://activetravel.com.au/Trips/west-timor-textiles-culture/] that has begun again to use its traditional plant dyeing techniques. We were treated to a demonstration of natural dyeing using local plants from the surrounding forest and from the village’s colour garden. Five of us were lucky enough to receive a small skein of the results as we got back on our bus. We were so grateful! The yellow in the photo above was made from turmeric root. However, it’s not easy for us in Australia to do as the turmeric is mixed with mango tree bark (an alternative is the bark of the jackfruit) after it’s been pounded. Without this , the turmeric dyes cotton black. The more turmeric used, the darker the yellow. The slightly darker shade of hand spun cotton next to the yellow was made by adding a small hand full of lime to the turmeric dye bath. We were told that if the lime had been added to a fresh turmeric bath the cotton would have been a brighter orange; using it for dyeing yellow had partially exhausted the bath of course. The lovely green is also a colour I will not be able to reproduce. It was made by pounding pandanus leaves with a green leaf known only as “forest vine” then adding “sour citrus juice” (?lemon?). We were also told that some dyers also add turmeric and mango bark but in what quantities? BTW, we were also told that in most areas green is made by dipping the thread in indigo and then in turmeric and mango mix. Since then I’ve learnt that the result is a much darker, more muted green that the fine zesty green produced in this village with the pandanus leaves. The indigo blue on the bottom left is also a surprise. Certainly, it is made with the fine green indigo leaves. However, the technique was unlike any I’ve seen in Australia. We get so careful with our “brews”. We abhor oxygen and lower and raise fibre or fabric very carefully to lock out oxygen . Our dyed material emerges an unoxidised green colour and becomes blue over time in the air. We are all told not to disturb the surface of the indigo dye bath. In Timor, the fine indigo plant leaves are pounded and left to soak in water overnight. 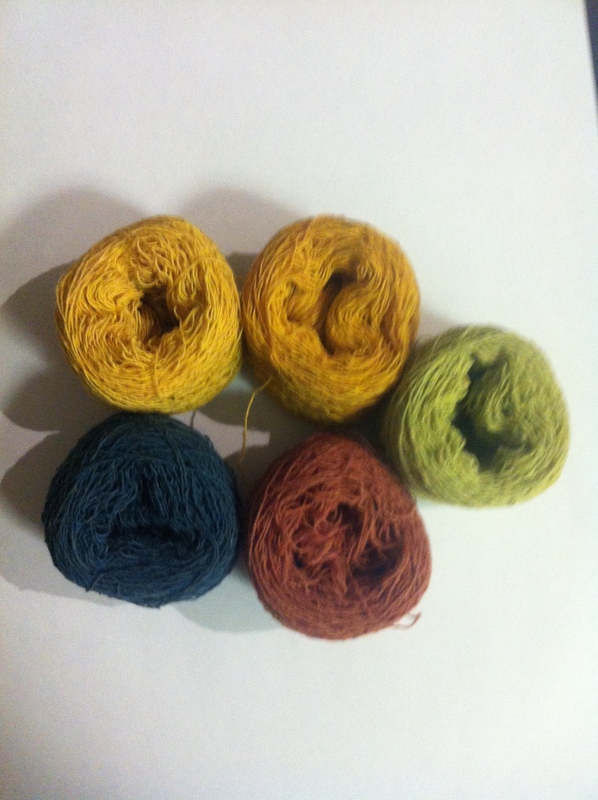 Then, when ready to dye, the dyers add lime powder. They then squeeze dry cotton yarn through it with their ungloved hands. More lime is added, fibre is squeezed through again. Then the liquid in the bath is discarded as soon as the fibre is soaked. New solution from the pounded indigo plant material is then added to the bath and the fibre and the lime is added once again. This process is repeated up to ten times. The young indigo leaves picked in the wet season from Jan to March give better colour. Finally, the red brown ball is dyed in morinda citrifolia (see https://en.wikipedia.org/wiki/Morinda_citrifolia) , a local tree. The colour comes from the bark of the tree root. This is the classic colour of many plant dyed fibres in Timor. The precise shade of red brown is determined by the composition of the soil and the numbers of times the thread is dipped in the dye. Preparation of the yarn is key. One recipe we were given (and there are many) was to soak 10 pounded candlenuts in 1.5 L of water overnight. Pound again and produce a waxy, oily paste. Manipulate the thread through this then dry it completely. Repeat the next day . Do this 5 or 6 times. Once the white colour of the cotton has become yellow, it’s ready to dye. I think I gathered that this candlenut is a source of tannin so it’s tannin that prepares the fibre for the morinda. But wait, there’s more. There is also a mordant. It’s called loba in the village (Symplocos cochinchinensis).Its root and, it turns out, the leaves are rich in aluminium. Too much information? Well, I just wanted the record for myself! Fascinating Margaret. I love to hear all the detail. I’m certainly itching to doing some more dyeing very soon. Maybe this week I can get around to it!